Magnetic levitation transport, or maglev, is a form of transportation that suspends, guides and propels vehicles (particularly trains) through the harnessing of electromagnetic force. This method of transport can be faster than wheeled mass transit systems, potentially reaching velocities comparable to turboprop and jet aircraft (500 kilometers per hour (km/h)). The maximum recorded speed of a maglev train is 581km/h, achieved in Japan in 2003. The term "maglev" refers not only to the vehicles but also to the railway system that is specifically designed for magnetic levitation and propulsion. 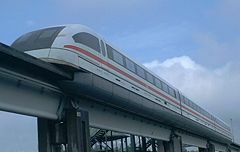 The first commercial Maglev was opened in 1984 in Birmingham, England, covering some 600 meters between its airport and railhub, but it was closed in 1995 due to technical problems. 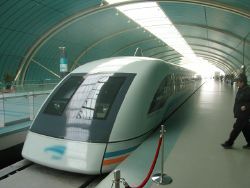 The only noteworthy high-speed maglev line that is currently operational is the IOS (initial operating segment) demonstration line of Shanghai, China, that transports people 30 kilometers (km) (18.6 miles) to the airport in just 7 minutes 20 seconds, achieving a top velocity of 431 km/h or 268 miles per hour (mph), averaging 250 km/h or 150 mph. Maglev trains need to be viewed as a technology of the future. Because they cannot share the infrastructure that exists for wheeled trains, maglevs must be designed as complete transportation systems. So far, scientific, economic, and political barriers have hindered widespread adoption of the technology. Nonetheless, maglev projects are being studied for feasibility in various parts of the world. High speed transportation patents would be granted to various inventors throughout the world. Early United States patents for a linear motor propelled train were awarded to the inventor, Alfred Zehden (German). The inventor gained a patent on June 21, 1902 and another on August 21, 1907. In 1907, another early electromagnetic transportation system was developed by F. S. Smith. A series of German patents for magnetic levitation trains propelled by linear motors were awarded to Hermann Kemper between 1937 and 1941. An early modern type of maglev train was described in , Magnetic system of transportation, by G. R. Polgreen (Aug 25, 1959). The first use of "maglev" in a United States patent was in "Magnetic levitation guidance". by Canadian Patents and Development Limited. Transrapid 05 was the first maglev train with longstator propulsion licensed for passenger transportation. In 1979 a 908 m track was open in Hamburg for the first International Transportation Exhibition (IVA 79). There was so much interest that operation had to be extended three months after exhibition finished, after carrying more than 50,000 passengers. It was reassembled in Kassel in 1980. The world's first commercial automated system was a low-speed maglev shuttle that ran from the airport terminal of Birmingham International Airport (UK) to the nearby Birmingham International railway station from 1984 to 1995. Based on experimental work commissioned by the British government at the British Rail Research Division laboratory at Derby, the length of the track was 600 m, and trains "flew" at an altitude of 15 mm. It was in operation for nearly eleven years, but obsolescence problems with the electronic systems made it unreliable in its later years and it has now been replaced with a cable-drawn system. Several favorable conditions existed when the link was built. The BR Research vehicle was 3 tons and extension to the 8 ton vehicle was easy. Electrical power was easily available. Airport and rail buildings were suitable for terminal platforms. Some Government finance was provided and because of sharing work, the cost per organization was not high. In Tsukuba, Japan (1985), the HSST-03 wins popularity in spite of being 30km/h and a run of low speed in Tsukuba World Exposition. In Okazaki, Japan (1987), the JR-Maglev took a test ride at holding Okazaki exhibition and runs. In Saitama, Japan (1988), the HSST-04-1 exhibited it at Saitama exhibition performed in Kumagaya, and runs. Best speed per hour 30km/h. In Yokohama, Japan (1989), the HSST-05 acquires a business driver's license at Yokohama exhibition and carries out general test ride driving. Maximum speed 42km/h. In Vancouver, Canada, the JR-Maglev held exhibition runs in 1986. In Hamburg, Germany, the TR-07 performed at an international traffic exhibition in 1988 (IVA88). In West Berlin, the M-Bahn was built in the late 1980s. It was a driverless maglev system with a 1.6 km track connecting three stations. Testing in passenger traffic started in August 1989, and regular operation started in July 1991. Although the line largely followed a new elevated alignment, it terminated at the U-Bahn station Gleisdreieck, where it took over a platform that was then no longer in use; it was from a line that formerly ran to East Berlin. After the fall of the Berlin Wall, plans were set in motion to reconnect this line (today's U2). Deconstruction of the M-Bahn line began only two months after regular service began and was completed in February 1992. 1979 - Japan - ML500 - 517km/h (unmanned)It succeeds in operation over 500km/h for the first time in the world. 1999 - Japan - MLX01 - 552km/h (manned/Five formation). Guinness authorization. 2003 - Japan - MLX01 - 581km/h (manned/Three formation). Guinness authorization. Transrapid, a German maglev company, has a test track in Emsland (Hermann Kemper's homeland) with a total length of 31.5 km. The single track line runs between Dörpen and Lathen with turning loops at each end. The trains regularly run at up to 420 km/h. The construction of the test facility began in 1980 and finished in 1984. Japan has a demonstration line in Yamanashi prefecture where test trains JR-Maglev MLX01 have reached 581 km/h (361 mph), slightly faster than any wheeled trains (the current TGV speed record is 574.8 km/h). These trains use superconducting magnets which allow for a larger gap, and repulsive-type Electro-Dynamic Suspension (EDS). In comparison Transrapid uses conventional electromagnets and attractive-type Electro-Magnetic Suspension (EMS). These "Superconducting Maglev Shinkansen," developed by the Central Japan Railway Company (JR Central) and Kawasaki Heavy Industries, are currently the fastest trains in the world, achieving a record speed of 581 km/h on December 2, 2003. Yamanashi Prefecture residents (and government officials) can sign up to ride this for free, and some 100,000 have done so already. 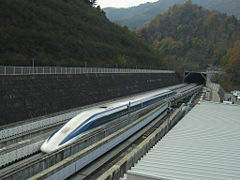 The world's first commercial automated "Urban Maglev" system commenced operation in March 2005 in Aichi, Japan. This is the nine-station 8.9 km long Tobu-kyuryo Line, otherwise known as the Linimo. The line has a minimum operating radius of 75 m and a maximum gradient of 6%. The linear-motor magnetic-levitated train has a top speed of 100 km/h. The line serves the local community as well as the Expo 2005 fair site. The trains were designed by the Chubu HSST Development Corporation (Japan Airlines developed it in the mid 1970s; it has since been withdrawn), which also operates a test track in Nagoya. Urban-type maglevs patterned after the HSST have been constructed and demonstrated in Korea, and a Korean commercial version Rotem is now under construction in Daejeon and projected to go into operation by April of 2007. In the US, the Federal Transit Administration (FTA) Urban Maglev Technology Demonstration program has funded the design of several low-speed urban maglev demonstration projects. It has assessed HSST for the Maryland Department of Transportation and maglev technology for the Colorado Department of Transportation. The FTA has also funded work by General Atomics at California University of Pennsylvania to demonstrate new maglev designs, the MagneMotion M3 and of the Maglev2000 of Florida superconducting EDS system. Other US urban maglev demonstration projects of note are the LEVX in Washington State and the Massachusetts-based Magplane. On December 31, 2000, the first crewed high-temperature superconducting maglev was tested successfully at Southwest Jiaotong University, Chengdu, China. This system is based on the principle that bulk high-temperature superconductors can be levitated or suspended stably above or below a permanent magnet. The load was over 530 kg and the levitation gap over 20 mm. The system uses liquid nitrogen, which is very cheap, to cool the superconductor. 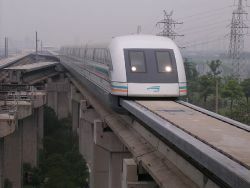 A maglev train coming out of the Pudong International Airport. Transrapid, in Germany, constructed the first operational high-speed conventional maglev railway in the world, the Shanghai Maglev Train from downtown Shanghai (Shanghai Metro) to the Pudong International Airport. It was inaugurated in 2002. The highest speed achieved on the Shanghai track has been 501 km/h (311 mph), over a track length of 30 km. The plan for the Shanghai-Hangzhou Maglev Train was approved by the central government in February 2006, with construction set to start by the end of 2006 for completion by 2010. A track of less than a mile in length was constructed at Old Dominion University in Norfolk, Virginia. Although the system was initially built by American Maglev Technology, Inc. (AMT), problems caused the company to turn it over to the University for research. The system is currently not operational, but research is ongoing to resolve stability issues with the system. This system uses a "smart train, dumb track" that involves most of the sensors, magnets, and computation occurring on the train rather than the track. This system will cost less to build per mile than existing systems. Unfortunately, the $14 Million originally planned did not allow for completion. Many maglev systems have been proposed in various nations of North America, Asia, and Europe. Many of the systems are still in the early planning stages, or, in the case of the transatlantic tunnel, mere speculation. However, a few of the following examples have progressed beyond that point. The master plan for the Chuo Shinkansen bullet train system was finalized based on the Law for Construction of Countrywide Shinkansen. The Linear Chuo Shinkansen Project aims to realize this plan through utilization of the Superconductive Magnetically Levitated Train, which connects Tokyo and Osaka by way of Nagoya, the capital city of Aichi in approximately one hour at a speed of 500km/h. This new high speed maglev line is planned to become operational in 2027, with construction starting 2017. Caracas – La Guaira: A maglev train is scheduled to be built this year connecting the capital city Caracas to the main port town of La Guaira and Simón Bolívar International Airport. Due to the extremely mountainous conditions which exist over this path, with traditional rail extensive use of tunnelling and bridging is required. 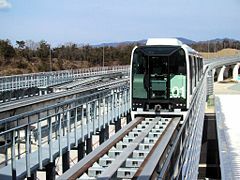 Maglev systems can negotiate altitudes of up to 10 percent, much steeper than those negotiable by standard rail systems, and as it may simply be able to climb over obstacles rather than be required to tunnel through or bridge over, this may make the maglev proposal more economically sound. The system is slated to be a stand-alone system of about 15 km. Shanghai – Hangzhou: China has decided to extend the world’s first commercial Transrapid line between Pudong airport and the city of Shanghai initially by some 35 kilometers to Hong Qiao airport before the World Expo 2010 and then, in an additional phase, by 200 kilometers to the city of Hangzhou (Shanghai-Hangzhou Maglev Train), becoming the first inter-city Maglev rail line in commercial service in the world. The line will be an extension of the Shanghai airport Maglev line. Talks with Germany and Transrapid Konsortium about the details of the construction contracts have started. On March 7 2006, the Chinese Minister of Transportation was quoted by several Chinese and Western newspapers as saying the line was approved. California-Nevada Interstate Maglev: High-speed maglev lines between major cities of southern California and Las Vegas are also being studied via the California-Nevada Interstate Maglev Project. This plan was originally supposed to be part of an I-5 or I-15 expansion plan, but the federal government has ruled it must be separated from interstate public work projects. Since the federal government decision, private groups from Nevada have proposed a line running from Las Vegas to Los Angeles with stops in Primm, Nevada; Baker, California; and points throughout Riverside County into Los Angeles. Southern California politicians have not been receptive to these proposals; many are concerned that a high speed rail line out of state would drive out dollars that would be spent in state "on a rail" to Nevada. Baltimore-Washington D.C. Maglev: A 64 km project has been proposed linking Camden Yards in Baltimore and Baltimore-Washington International (BWI) Airport to Union Station in Washington, D.C. It is in demand for the area due to its current traffic/congestion problems. The Baltimore proposal is competing with the above-referenced Pittsburgh proposal for a $90 million federal grant. electromagnetic suspension (EMS) uses the attractive magnetic force of a magnet beneath a rail to lift the train up. electrodynamic suspension (EDS) uses a repulsive force between two magnetic fields to push the train away from the rail. In current EMS systems, the train levitates above a steel rail while electromagnets, attached to the train, are oriented toward the rail from below. The electromagnets use feedback control to maintain a train at a constant distance from the track. In Electrodynamic suspension (EDS), both the rail and the train exert a magnetic field, and the train is levitated by the repulsive force between these magnetic fields. The magnetic field in the train is produced by either electromagnets (as in JR-Maglev) or by an array of permanent magnets (as in Inductrack). The repulsive force in the track is created by an induced magnetic field in wires or other conducting strips in the track. At slow speeds, the current induced in these coils and the resultant magnetic flux is not large enough to support the weight of the train. For this reason the train must have wheels or some other form of landing gear to support the train until it reaches a speed that can sustain levitation. Propulsion coils on the guideway are used to exert a force on the magnets in the train and make the train move forwards. The propulsion coils that exert a force on the train are effectively a linear motor: An alternating current flowing through the coils generates a continuously varying magnetic field that moves forward along the track. The frequency of the alternating current is synchronized to match the speed of the train. The offset between the field exerted by magnets on the train and the applied field create a force moving the train forward. Each implementation of the magnetic levitation principle for train-type travel involves advantages and disadvantages. Time will tell as to which principle, and whose implementation, wins out commercially. EMS (Electromagnetic) Magnetic fields inside and outside the vehicle are insignificant; proven, commercially available technology that can attain very high speeds (500 km/h); no wheels or secondary propulsion system needed The separation between the vehicle and the guideway must be constantly monitored and corrected by computer systems to avoid collision due to the unstable nature of electromagnetic attraction. EDS (Electrodynamic) Onboard magnets and large margin between rail and train enable highest recorded train speeds (581 km/h) and heavy load capacity; has recently demonstrated (Dec 2005) successful operations using high temperature superconductors in its onboard magnets, cooled with inexpensive liquid nitrogen Strong magnetic fields onboard the train would make the train inaccessible to passengers with pacemakers or magnetic data storage media such as hard drives and credit cards, necessitating the use of magnetic shielding; vehicle must be wheeled for travel at low speeds; system per mile cost still considered prohibitive; the system is not yet out of prototype phase. Inductrack System (Permanent Magnet EDS) Failsafe Suspension - no power required to activate magnets; Magnetic field is localized below the car; can generate enough force at low speeds (around 5 km/h) to levitate maglev train; in case of power failure cars slow down on their own safely; Halbach arrays of permanent magnets may prove more cost-effective than electromagnets Requires either wheels or track segments that move for when the vehicle is stopped. New technology that is still under development (as of 2007) and has as yet no commercial version or full scale system prototype. Neither Inductrack nor the Superconducting EDS are able to levitate vehicles at a standstill, although Inductrack provides levitation down to a much lower speed. Wheels are required for both systems. EMS systems are wheel-less. The German Transrapid, Japanese HSST (Linimo), and Korean Rotem EMS maglevs levitate at a standstill, with electricity extracted from guideway using power rails for the latter two, and wirelessly for Transrapid. If guideway power is lost on the move, the Transrapid is still able to generate levitation down to 10 km/h speed, using the power from onboard batteries. This is not the case with the HSST and Rotem systems. An EMS system can provide both levitation and propulsion using an onboard linear motor. EDS systems can only levitate the train using the magnets onboard, not propel it forward. As such, vehicles need some other technology for propulsion. A linear motor (propulsion coils) mounted in the track is one solution. Over long distances where the cost of propulsion coils could be prohibitive, a propeller or jet engine could be used. Static magnetic bearings using only electromagnets and permagnets are unstable, as explained by Earnshaw's theorem. EMS systems rely on active electronic stabilization. Such systems constantly measure the bearing distance and adjust the electromagnet current accordingly. As all EDS systems are moving systems (that is, no EDS system can levitate the train unless it is in motion), Earnshaw's theorem does not apply to them. Due to the lack of physical contact between the track and the vehicle, there is no rolling friction, leaving only air resistance (although maglev trains also experience electromagnetic drag, this is relatively small at high speeds). Maglevs can handle high volumes of passengers per hour (comparable to airports or eight-lane highways) and do it without introducing air pollution along the right of way. Of course, the electricity has to be generated somewhere, so the overall environmental impact of a maglev system is dependent on the nature of the grid power source. The weight of the large electromagnets in EMS and EDS designs is a major design issue. A very strong magnetic field is required to levitate a massive train. For this reason one research path is using superconductors to improve the efficiency of the electromagnets. The high speed of some maglev trains translates to more sound due to air displacement, which gets louder as the trains go faster. A study found that high speed maglev trains are 5dB noisier than traditional trains.At low speeds, however, maglev trains are nearly silent. The Shanghai maglev cost 9.93 billion yuan (US$1.2 billion) to build. This total includes infrastructure capital costs such as manufacturing and construction facilities, and operational training. At 50 yuan per passenger and the current 7,000 passengers per day, income from the system is incapable of recouping the capital costs (including interest on financing) over the expected lifetime of the system, even ignoring operating costs. China aims to limit the cost of future construction extending the maglev line to approximately 200 million yuan (US$24.6 million) per kilometer. These costs compare competitively with airport construction (for example, Hong Kong Airport cost US$20 billion to build in 1998) and eight-lane Interstate highway systems that cost around US$50 million per mile in the US. While high-speed maglevs are expensive to build, they are less expensive to operate and maintain than traditional high-speed trains, planes or intercity buses. Data from the Shanghai maglev project indicates that operation and maintenance costs are covered by the current relatively low volume of 7,000 passengers per day. Passenger volumes on the Pudong International Airport line are expected to rise dramatically once the line is extended from Longyang Road metro station all the way to Shanghai's downtown train depot. The proposed Chūō Shinkansen maglev in Japan is estimated to cost approximately US$82 billion to build. The only low-speed maglev (100 km/h) currently operational, the Japanese Linimo HSST, cost approximately US$100 million/km to build. Besides offering improved O&M costs over other transit systems, these low-speed maglevs provide ultra-high levels of operational reliability and introduce little noise and zero air pollution into dense urban settings. As maglev systems are deployed around the world, experts expect construction costs to drop as new construction methods are perfected. 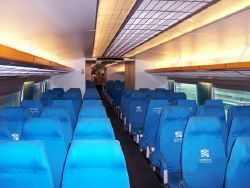 On August 11, 2006 a fire broke out on the Shanghai commercial Transrapid, shortly after leaving the terminal in Longyang. On September 22, 2006 an elevated Transrapid train collided with a maintenance vehicle on a test run in Lathen (Lower Saxony / north-western Germany). Twenty-three people were killed and ten were injured. These were the first fatalities resulting from a Maglev train accident. ↑ U.S. Patent 782312 (PDF) Retrieved December 28, 2017. ↑ U.S. Patent RE12700 (PDF) Retrieved December 28, 2017. ↑ U.S. Patent 859018 (PDF), Jul 2, 1907. Retrieved December 28, 2017. ↑ U.S. Patent 3158765 (PDF). Retrieved December 28, 2017. ↑ U.S. Patent 3858521 (PDF); Mar 26, 1973. Retrieved December 28, 2017. ↑ The AMT Story Retrieved December 28, 2017. ↑ American Maglev Technology (AMT) Assessment June 5, 2013. Retrieved December 28, 2017. ↑ UK Ultraspeed. Retrieved December 28, 2017. ↑ Martin Wainwright, Hovertrain to cut London-Glasgow time to two hours Gaurdian Unlimited, August 8, 2005. Retrieved December 28, 2017. ↑ Joos Vos, Annoyance caused by the sounds of a magnetic levitation train The Journal of the Acoustical Society of America (March 2004). Retrieved December 28, 2017. ↑ 13.0 13.1 Miao Qing, Shanghai maglev gets official approval, China Daily, April 27, 2006. Retrieved December 28, 2017. ↑ 2004. Shanghai maglev ticket prices cut by 1/3., China Daily, April 15, 2004. Retrieved December 28, 2017. ↑ 2004. Nagoya builds Maglev Metro, International Railway Journal, May 1, 2004. Retrieved December 28, 2017. Hood, Christopher P. Shinkansen – From Bullet Train to Symbol of Modern Japan. London, UK: Routledge, 2006. ISBN 0415320526. Lynch, Thomas. High Speed Rail in the US: Super Trains for the Millennium. London, UK: TF-CRC, 1998. ISBN 9056996053. Moon, Francis C. Superconducting Levitation Applications to Bearings and Magnetic Transportation. Berlin, Germany: Wiley-VCH, 1994. ISBN 0471559253. Kluhspies, Dr. Johannes. Maglev World Forum Maglev. University of Washington. High Speed Surface Transport (HSST) : A Japanese Maglev Technology University of Washington. Muller, Christopher. Magnetic Levitation for Transportation RailServe. Bonsor, Kevin. How Maglev Trains Work HowStuffWorks. This page was last modified on 7 August 2018, at 18:02.